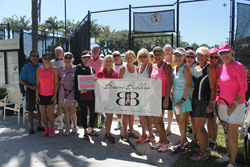 Fiddler’s Creek raised $9,000 during its second annual Bosom Buddies tennis exhibition and silent auction, more than doubling its contribution to the Naples charity from the inaugural event in 2015. “Fiddler’s Creek is a compassionate and generous community,” said Aubrey Ferrao, president and CEO Fiddler’s Creek. “Fiddler’s Creek is a compassionate and generous community,” said Aubrey Ferrao, president and CEO Fiddler’s Creek. “We’re pleased to make this contribution on our residents’ behalf to such a worthwhile organization,” continued Aubrey Ferrao. The January 30 exhibition featured Scott Pennington and Desislav Borov, tennis pros at The Club & Spa at Fiddler’s Creek, who competed against two local players and attracted so many attendees the staff had to expand the available spectator seating. Silent auction items featured ballroom dancing lessons; tennis, wine and food-themed baskets; boating and fishing excursions; kayak ecoadventures; rounds of golf and more, which were donated by Fiddler’s Creek tennis league members, residents and local businesses. Because of the success of the exhibition and silent auction, the Fiddler’s Creek community is recruiting a volunteer tennis committee to plan the 2017 event. “We are already planning for big things next year,” Albeit said. Located on Collier Boulevard on the way to Marco Island, Fiddler’s Creek is an award-winning residential community in Naples. Most recently, the Fiddler’s Creek real estate community was named a Distinguished Emerald Club by BoardRoom magazine - a prestigious honor reserved for only the top 5 percent of private clubs in the world. Resort-inspired amenities at the Naples residential community include the 54,000-square-foot Club & Spa at Fiddler’s Creek, offering a fitness center, tropical lagoon-style swimming complex, tennis courts, and both elegant and casual dining at Caxambas and the Gator Grille. Fiddler’s Creek also offers an extensive social calendar including themed parties, happy hours, clubs and classes, and children’s activities. Fiddler’s Creek offers unique home buying opportunities in Naples. Fiddler’s Creek residents seeking a beach and boating lifestyle have the opportunity to join the Tarpon Club. The club features a full-service marina, social activities on and off the water, and beach pavilion access at the award-winning Marco Beach Ocean Resort, and resort and spa privileges. Additionally, the Fiddler’s Creek community residents have the opportunity to enjoy championship golf by joining The Golf Club at Fiddler’s Creek. Designed by celebrated course architect Arthur Hills, the signature 18-hole Creek Course has been named among Golfweek Magazine’s Top 100 Best Residential Golf Courses in the country for 11 consecutive years. A limited number of non-resident annual and seasonal memberships, with term date flexibility, are currently available at both The Golf Club and The Tarpon Club at Fiddler’s Creek. Homes within Fiddler’s Creek are located within picturesque residential villages nestled along lakes, golf course fairways and conservation areas. The Fiddler’s Creek real estate options include coach, villa, single-family and custom estate homes. Pre-construction and move-in-ready homes are priced from the $400,000s to over $2 million and are offered by four of the area’s most respected homebuilders – Ashton Woods Homes, Taylor Morrison, Lennar Homes and D.R. Horton. For membership details and more information about Fiddler’s Creek, call 239-732-9300, stop by the Fiddler’s Creek Information Center at 8152 Fiddler’s Creek Parkway, or visit http://www.fiddlerscreek.com. Aubrey Ferrao is the president and CEO of Fiddler’s Creek.